Perhaps he could ask Gavyn Davies to investigate? For many years he has been advised by Gavyn Davies, who made some £150 million during his period as a Goldman Sachs partner. It was Davies who last year urged Gordon to implement Mugabenomics, turn on the printing presses and call it quantitative easing. Davies has been a big donor to the Labour Party and a long-term supporter. Davies’ wife Sue Nye was Gordon’s private secretary in Downing Street and they are known to be good friends. Perhaps it was they who stole Gordon’s moral compass. Exactly how many boardroom lunches and suchlike did Gordon Brown have with Goldman Sachs figures? During the many lunches Gordon had with Goldman Sachs did he discuss policy or matters which they were able to exploit to their advantage in the markets? 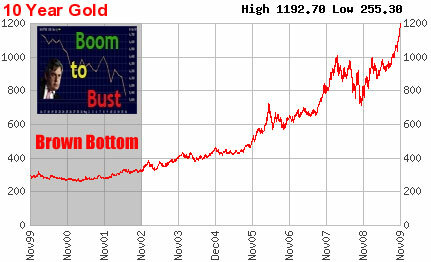 Goldmans were known to be major sellers of gold before Brown announced his extraordinarily ill-conceived plan to sell the Bank of England’s gold reserves. Gavyn Davies was an adviser to Gordon Brown during this period. Did he recommend, advise on or know anything of the intended gold sales policy? Did Sue Nye know of the intention to sell gold?